But it occurred to me that the a not-dissimilar protest has been taking place in comicdom. And the more that influential people started going outside the system, it seems, the more the existing system started folding in on itself. Stories from Marvel and DC (and, to a lesser extent, some other publishers as well) became more and more insular such that many books are impenetrable without loads of back-story knowledge and line-wide purchases on the part of the reader. You know the story of Marvel Comics, right? Stan Lee, Jack Kirby, and Steve Ditko. The history of DC is similar, too. Siegel and Shuster, Finger and Kane. When we talk about how those companies were built on ingenuity and creative output, we can point to a small handful of individuals who had a lot of talent. (And I'm not necessarily talking about the ability to write or draw.) And the companies these days? Oh, you know the names of the creators, I'm sure, but they're not reinventing the industry the way, say, Will Eisner did. Not that the current crop of creators there aren't talented, mind you, but they're not exactly in the same class. Now we could argue all day and night about how creator-x is a much better illustrator than Kirby or Kane or whomever. But that's not the point. The point is that those guys "back in the day" saw new ways to do things. They were able to "think different." 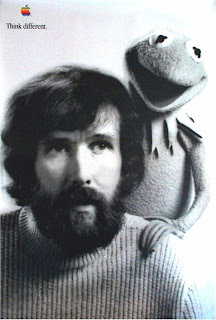 Jim Henson is a great example of that, too. Not for coming up with Kermit or Seasame Street or The Muppets but because he saw how television was being made and decided it didn't have to be done that way. Have you ever heard his proposal for Fraggle Rock? "Let's make a show that will bring peace to the world." That wasn't a statement of naivete -- he knew full well that's an impossible goal -- but he also realized that didn't preclude the idea from being discussed. He completely re-thought the whole notion of television programming. So, who's re-thinking comics? Who is comics' John Galt? Are they the webcomic creators who are trying to figure out ways to make a living by giving their content away online? Are they self-publishers, printing their own books and soliciting them in avenues OTHER than Diamond's Previews? Are they bloggers, taking news and media hype away from their sources and turning journalism on its head? Are they the fans who've stopped spending money on comics entirely, but still read them on a daily basis? The questions are rhetorical. Rand's novel is stylized enough that any direct analogies are going to be imperfect at best. (I ran across a recent review which said Rand's characters were closer to those found in a comic book than ones found in real life.) But it still provides an interesting line of thought -- can the "looters" (Rand's term) of Kirby's and Shuster's and Ditko's legacies be taught a lesson about how creative genius should be revered and not squandered by following through on our own values? If we the fans really like the creativity and energy of good, well-executed comics, shouldn't we only provide support to those people we deem to be creating them? 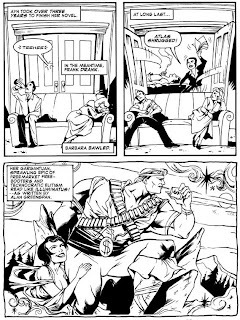 Shouldn't we boycott (or "go Galt") against pamphlet comics that have been strip-mining the works of others? I'm not advocating that you stop buying comics from a publisher just because they're using characters not created by the current creative team. What I am advocating is really putting your money where your mouth is. If you don't like the mega-company-wide crossovers that seem to go on without end any more, stop buying them. And if that leaves the one book you actually enjoyed incomprehensible because you're only getting part of the story, stop buying that, too. My point here is that comics are a business. Truth, justice and the American Way be damned, it's capitalism. The comics that are being published successfully month after month are the ones that people buy month after month. Why do you think we've gotten so many comics using an appearance by Barack Obama as a cheap gimmick? Because people keep buying them! As long as people keep buying them, publishers will keep producing them. We saw the exact same thing a decade ago with all the embossed, die-cut, foil-stamped covers. Look at the numbers -- those issues sold better than other comics, so publishers continued the practice until people finally stopped buying them. You, the reader, have a great deal of power in your wallet. Sure, your four bucks isn't huge in and of itself when you're comparing it against 20,000 other people's four bucks. But if a publisher loses your four bucks, and the next guy's four bucks, and the next guy's four bucks... it won't take long for them to realize that their 20,000 readers has dropped down to 1,000. There's no lack of good, even great, comics out there. Not every book is going to be suited to every individual, of course, but there's something out there that you WILL enjoy. Spend your money on that, and not on any ol' drivel that happens to have a neat character in it created by some talented creator who died 15 years ago. Hmmmmm. I'm going to guess that YouTube or Twitter have already drained more productivity from the American economy than a John Galt movement is going to, no matter how long the "protest" lasts. I'd suggest, as I always do, that when the Big Two start finding fewer pieces of shipwreck to cling to, they just cling all the harder to what pieces they've got left. I stopped reading Marvel in the Nineties, and they responded by getting even Nineties-er, you know? Unless all the people dumping comics they hate write letters to the dump-ees telling them that's what they're doing, you can crash those companies (theoretically) but not change them: because the market they're left with is the one they've got to make a living from, no matter what its size happens to be. But then, as we've seen, if they do crash then they might get desperate, and start trying anything they can, even making better books...but this isn't 1961 anymore, and so it won't last. They sell what they sell. When people stop buying Product X, it doesn't turn into Product Y, it just sells a lot less, and then one day it stops being made. However, on the other hand...who cares? If you're not reading crap you hate, isn't that reward enough for not reading it? So forget the myth of voting with your dollar, forget changing things you hate...just spend your money elsewhere, and have a good time. As to "going Galt"...wow, to imagine the top tax rate will go down because there are fewer people making enough to have to pay it sounds like some extreme wishful thinking. A bit like not buying Spider-Man, in the hopes that readership will go down so far they'll start giving 'em away.